Gold was either side of unchanged last night, trading in a range of $1290.35 - $1297.35. It slipped to its $1290.35 low during Asian hours despite a tick down in the dollar (DX from 94.17 – 94.10), fading a move higher in the US 10-year bond (2.90% - 2.926%) and firmer global equities, with Friday’s strong US Jobs report still resonating. The NIKKEI was up 1.4%, the SCI +0.5%, Eurozone markets were +0.1% to +0.9%, and S&P futures were +0.4%. A modest pullback in oil (WTI from $65.70 - $65.25) weighed on stocks. During European time however, the dollar plunged to 93.66 (1-week low), pressured by a stronger euro ($1.1662 - $1.1744, shrugs off weaker Eurozone Sentix Investor Confidence, political tensions eased in Italy). 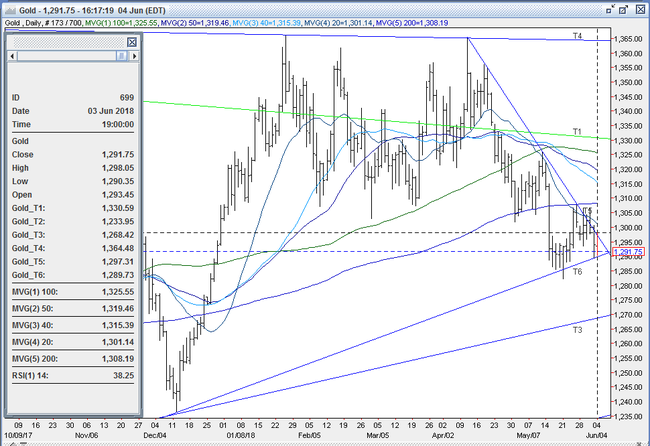 Gold rallied to its high of $1297.35, but was capped there at the down trendline from 4/11 $1365 top. US stocks opened stronger, (S&P + 15 to 2749), with Apple leading the tech sector higher. The 10- year yield hovered around 2.92%, but the DX bounced to 93.92. Gold softened in response, and pulled back to $1294. At 10 AM, a weaker than expected reading on US Factory Orders (-0.8% vs. exp. 0.5%) helped knock US stocks lower (S&P +6 to 2740). The 10-year yield ticked down to 2.913%, and the DX dipped to 92.82. Gold had a brief rebound, and bounced back to $1296. During the late morning and into the early afternoon, US stocks clawed back higher (S&P +13 to 2748) and the 10-year yield ticked up to 2.935%. 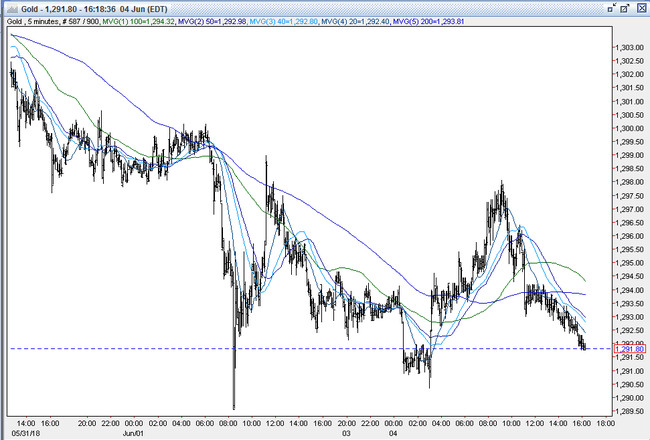 The DX tripped some stops over 94 and reached 94.14, and pressed gold lower. The yellow metal traded down to $1292.25, where some bargain hunting buying held ahead of the overnight low. Later in the afternoon, US stocks rose remained fairly firm (S&P ends +12 to 2747, NASDAQ closed at record high on strong tech rally), while the 10-year yield kept climbing to 2.946%. The DX was steady between 94 and 94.05, and gold ticked lower. It touched $1291.60 late in the session and was $1292 bid at 4PM with a loss of $2. Open interest was off 4.5k contracts, showing a net of long liquidation from Friday’s decline. Volume was similar to Friday’s with 331k contracts trading. Bulls were disappointed that gold couldn’t breach $1297 (down trendline from 4/11 $1365 top) or even post a gain today - given the pullback in the dollar. However, they are pleased that support at $1289 has held (up trendline from 12/15/16 $1123 low), and encouraged by the bullish set up from Friday’s COT Report (positive sentiment, still very light NFLP, somewhat elevated gross shorts). They believe that the dollar’s recent run up from 89.25 – 95.03 (+6.48%, 14-day RSI touched 78.4) in the past 6 weeks has been vastly overdone, and expect a major pullback in the DX to fuel a gold rally. The bulls look for a breach of $1308 (200-day moving average) to trip some momentum playing new longs to enter to bring about a quick test of $1315. All markets will continue to focus on the volatility in the equity and bond markets, geopolitical events (especially Italy, Spain, and North Korea), developments with the Trump Administration (especially on US-China trade), corporate earnings, oil prices, and will turn to reports tomorrow on Japanese PMI, Chinese Caixin PMI, Eurozone PMI’s and Retail Sales, US Services PMI, JOLTS Job openings, and ISM Services for near term guidance.